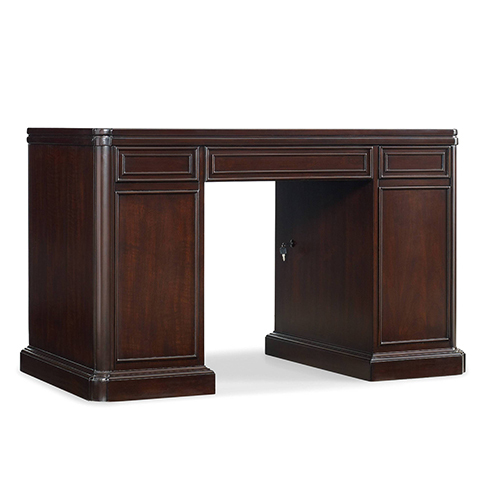 Computer desks are an integral aspect of your home office furniture and provide a contemporary accent to your décor. With mindboggling variety of finishes and styles available, beautifully crafted desk and cart designs will look sleek in your home. Choose from corner computer desks and laptop stands to computer workstations that combine elegant hues with highly functional designs for a distinct transitional feel. Contemporary spaces do well with seamlessly-crafted, space saving options or the more comprehensive desks that offer ample storage space. 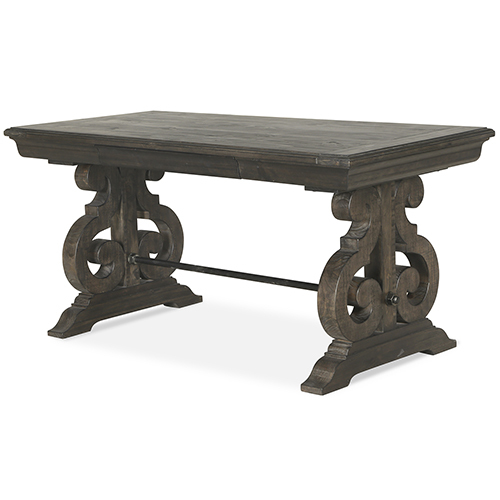 To add rustic charm to your décor, opt for traditional, no-frill designs showcasing the elegance of wood at its best. Our computer desks add value to your home office and are convenient solutions for designating a fixed place to your desktop or laptop. Glass top desks look modern and keep work supplies visible for easy access. Height adjustable workstations enable placing the computer at your eye level for working in comfort, while the reversible workstations allow multiple configuration options for optimizing space. Skim through our collection of computer desks from trusted brands if you desire one or more of these features. Wood adds rich texture in many colors and finishes that elevate the visual interest of your office. If you don’t have a home office per se, a portable laptop cart can do well in your bedroom as well. Choosing the best computer desk for you comes down to your unique sense of style and functionality. You want it to look stunning, but also help you comfortably accomplish your work goals. Decide whether you need a desk for your computer or laptop, and choose from styles of contemporary, transitional, traditional and rustic, among others. Small spaces do well with corner desks and laptop carts while bigger rooms can easily accommodate workstations or desks with hutch/storage. Consider the features you want your computer desk to have from portability and reversibility to adjustable height and position. It’s best to match the hues and finish with the rest of your home decor for an eye-pleasing presentation. Q: What size - or width - computer desk do I need? A: When it comes to your computer desk, you’ll want a design that offers a functional workspace that caters to your personal needs. On average, most desks are around 60 inches wide and 30 inches deep to accommodate various computer sizes. You’ll also want a desk that’s a comfortable height for writing and typing, so look for styles that stand anywhere from 24 to 30 inches tall. Q: How tall are computer desks? A: Most desks stand anywhere from 24 to 30 inches tall in order to create a comfortable workspace for both writing and typing. If you plan on using your desk primarily for computer typing, look for a desk that’s approximately 24 to 28 inches tall. If you’re particularly tall or petite, you may prefer an adjustable design that can be shortened or raised to heights of 22 inches to 33 inches depending on your personal needs. Q: What are the advantages and disadvantages of a corner computer desk? A: Corner desks are a wonderful solution for many different room layouts, and they can help your office fit into a small or challenging space. These desks are particularly ideal for studio apartments, multi-purpose rooms and open floor plans as well. That being said, they don’t offer as much privacy as traditional desk placements. You’ll also be stuck looking at a wall, which may hinder or increase your overall productivity depending on your work style. Q: Do all computer desks offer storage? A: Not all computer desks offer storage solutions, so be sure to choose a style that accommodates your office needs. Some styles - like laptop stands and utility tables, for example - only provide a surface area for writing and typing, while others complement your workspace with plenty of cabinets, drawers and shelves. Q: Do any computer desks have wheels to move around easily? A: Laptop carts are a perfect solution for moveable workstations. 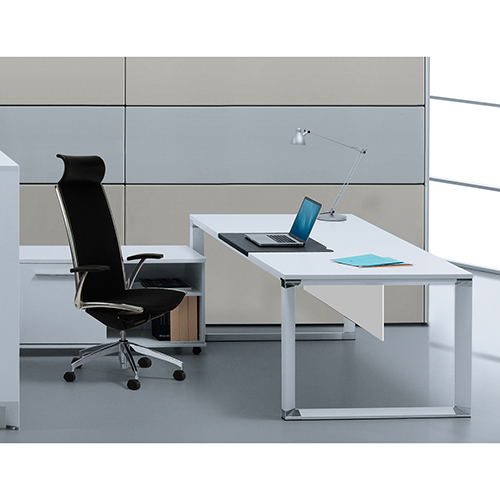 Typically made with casters at the base and the added stability of locking mechanisms, these designs oftentimes feature adjustable swivel tops that let you work from seated or standing positions. These desks are ideal for workspace versatility and can slide under a couch or chair to offer maximum comfort wherever you please.